Smaller Project 6-1, Great Room Remodeling » Roger Perron Inc. This great room remodeling plan converted their cramped kitchen into a wide-open plan that allows viewing of the yard and pool. 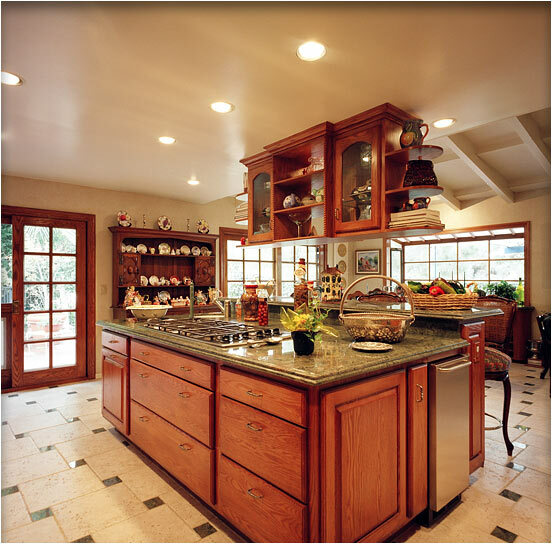 The island complements the kitchen workability and provides a filter for the dining room and family room. The floor was replaced with stone tile on a diagonal pattern. See photo 2 for before remodel. Design plan by Roger Perron, design- build contractor; interior decorating design for this Beverly Hills home was created by Marilyn Brown.